Want to join us in our efforts to create a place for every kid on the playground — a place where every kid belongs, has fun and is part of the game? We aim for 3.5 million children in 7,000 elementary schools nationwide to experience safe, healthy play every day by December 2020 . . . and we need your help. Play partners and corporate partners play a critical part in helping us achieve this goal. Engage your team. 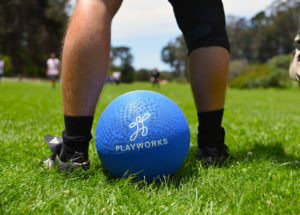 Playworks wants to help you turn your employees into community game-changers. We facilitate custom volunteer engagements ranging from Play Days in local schools to playspace transformations. Our expert and energetic staff will train, support, and empower your employees to make an impact in our community while also having a great time together. Get back on the playground and be a role model for low-income elementary school children! Play Days provide employees the opportunity to engage directly with local kids in Playworks partner schools, energizing education by modeling and facilitating healthy, active, inclusive play. Play Days include a fast, fun, hands-on immersion in Playworks techniques and games, followed by volunteer time with children (supported by Playworks staff) during one or more school recesses, and a closing debrief for volunteers. Kids are thrilled to have adults playing with them and they learn valuable social skills from adult role models. Interested in booking a Play Day? Contact us by completing this short form. Playspace transformations allow employees to create dramatic visual and practical changes in our region’s schools through activities such as playground overhaul and beautification, mural paintings, and indoor playspace refurbishments. Revive a playspace and beautify recess! We provide the paint and the fun. 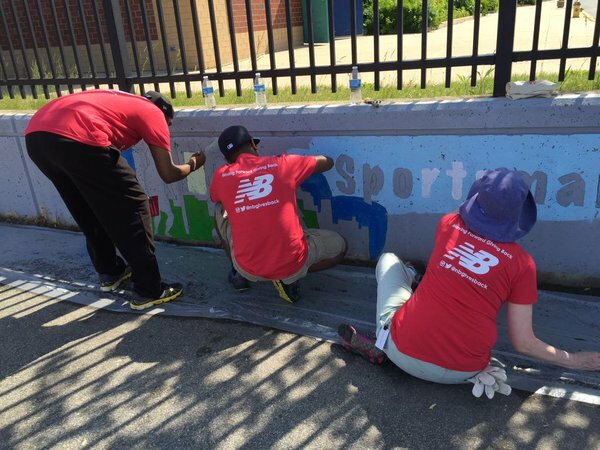 Your employees provide the energy and hands to brighten low-income school playgrounds by painting four-square courts, peace paths and game boundaries. The best part is seeing photos of the children’s faces when they return to school and see a transformed playspace. When: Dependent on school schedules; usually when school is not in session. Help kids dream big with motivating murals! 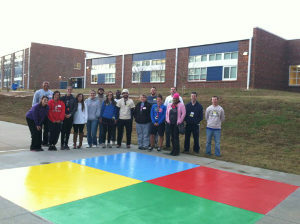 Your team will create beautiful murals to be placed at one or several of our partner schools. The murals serve as reminders of our core values and motivate children to dream big and persevere. Interested in learning more? Contact us by completing this short form. Your corporate group can field a winning team, or individual employees can be winners as tournament-day volunteers. Increase Employee Engagement: Corporate Kickball offers a team-building opportunity outside the office that is inclusive, collaborative and fun! Raise Visibility: Title sponsors are recognized with logo placement on the Playworks website, annual report, newsletter, and other collateral. Support the Local Community: Money raised from Corporate Kickball sponsorships goes back to our community to support our efforts to bring safe and inclusive play to more kids. The majority of your sponsorship fee is tax deductible. 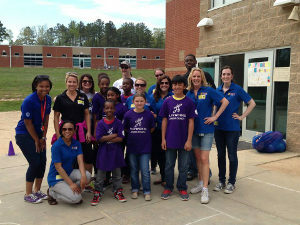 Bring Playworks experts to your office to lead engaging team-building activities on-site; for groups of any size. Corporate Recess is a way for companies to improve engagement and wellness within their organization by using the power of play. Through a selection of different targeted workshops we infuse playfulness and fun into the corporate environment in order to help our partners increase creativity, productivity, teamwork, and workplace health. Playfulness, fun, and games at work can improve office climate and productivity. This leads to happier employees with stronger connections to their organizations. In this hour-long workshop, we’ll help promote office wellness by getting your employees in the game! 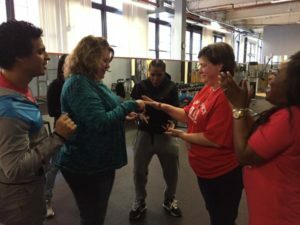 We’ll lead your team through a fun series of activities designed to get employees moving, competing in teams, and having fun while improving their strength, coordination, and flexibility. Out of fresh ideas? We’ll lead games that shake up the neural networks to inspire creative problem-solving, which you can bring back to the boardroom to inspire out-of-the-box brainstorming and avoid future brain blocks. Engage in a short corporate recess that will help promote office wellness. Once the games are done, it is time to bring your team together in service. We will work with your team to create a service project that will help the students served by Playworks and will also provide your team with high-impact community service. Introducing a new kind of Playworks Coach: the Corporate Coach. 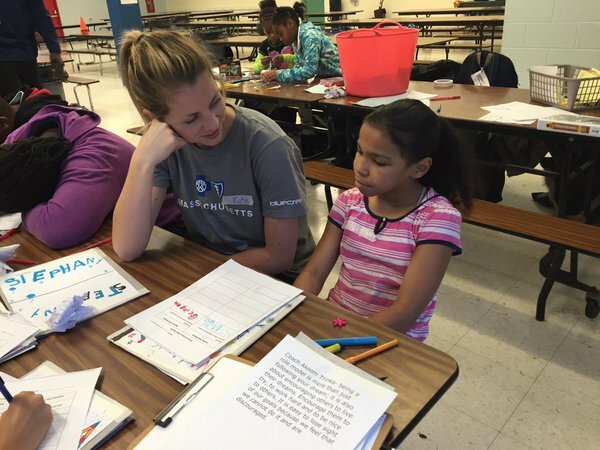 Corporate Coach is an opportunity for a group of colleagues to lead fourth and fifth graders as they serve as Junior Coaches for an entire school year. Volunteers will be able to teach the Junior Coaches critical 21st century skills through a pre-set curriculum during Playworks-led field trips held in their own office building. The Corporate Coach program provides a unique opportunity for our Junior Coaches to interact with and learn from our corporate partners. Not many of our Junior Coaches have the chance to meet experts from various professional fields, let alone the chance to learn directly from those experts. Junior Coaches will learn about financial literacy, leadership, goal-setting, and other fields from these experts, expanding their knowledge base and helping to address the opportunity gap faced by low-income youth. Employee “coaches” impact the Junior Coaches beyond what they teach—by serving as positive role models we can future engrain our core values of respect, inclusion, healthy play, and healthy community. Financially, Playworks also benefits from sustaining support that not only offsets the cost of the Corporate Coach program, but also provides funds to cover the cost of our operations and growth. With more corporate support, we will be able to expand our program even more than we have in our first five years. Identify internal “coaches” to meet at least two times per year with Junior Coaches from a specific school at their offices (8-24 employees). Mentor Junior Coaches—following either a pre-existing curriculum or one developed in partnership with Playworks. Host Junior Coaches, volunteers, and their families for an end-of-year celebration. 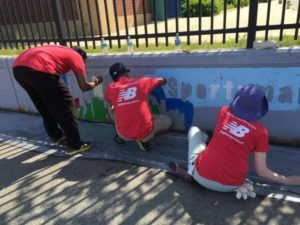 Our partner organizations benefit from providing a unique volunteer opportunity for their employees. Unlike many volunteer opportunities, being a Corporate Coach is a chance to impart knowledge and expertise to a group of youth. Employees benefit from feeling like their experience and knowledge are being put to good use, which provides a deeper level of engagement in the program.